~SOLD~Mosrite Japan Excellent 65 Sunburst N.O.S. ~SOLD~Mosrite Japan Johnny Ramone Sig. Realer that the Real Thing, all the weight & tone, without the crazy price tag. The Duncan P-Rails are fantastic in this guitar, it's got the quality wood to really make them sing. 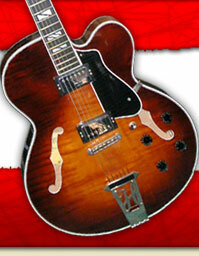 The P-90 option makes it growl like it should, the humbucking mode is sweet and bright. Stunning Japanese made Burny S.G. Custom type in black with well aged gold hardware.In very good shape for age, some marks and minor dings all over, but nothing showing the wood. Perfect neck shape, some minor fret wear in the places it should be. Long neck tenon, ask for pics if needed. Rarely seen Burny SG copy in way above average condition for age. No breaks often associated with this model. Wiring & pickups seems 100% original. Correct early "bell" truss rod cover indicates Japanese manufacture, also has the occasionally seen serial number under the neck pickup. It’s a lefty Edwards.. at last!! Good solid instrument of ROCK.Black.